June 2, 2015 – Data collected by the Southwest Research Institute’s Alice instrument aboard the Rosetta spacecraft reveal that electrons close to the surface of comet 67P/Churyumov-Gerasimenko — not photons from the sun, as had been believed — cause the rapid breakup of water and carbon dioxide molecules spewing from the comet’s surface. Analysis of the relative intensities of observed atomic emissions allowed the Alice science team to determine the instrument was directly observing the “parent” molecules of water and carbon dioxide that were being broken up by electrons in the immediate vicinity, about one-sixth of a mile (one kilometer) from the comet’s nucleus. 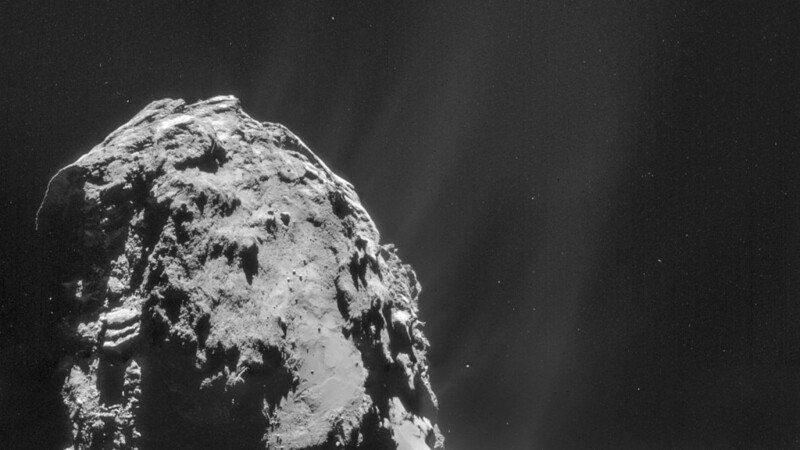 The carbon dioxide and water are being released from the comet’s nucleus and affected by electrons near the nucleus.